Bilton Continental Hotel is located at 16, Umaru Musa Yaradua Drive, Owerri, Imo, Nigeria. It is about 33 minutes from the Sam Mbakwe Airport. Bilton Hotel has well-furnished rooms which are of different categories. These categories are the Single Room, Deluxe, Classic, Studio and the Bilton Continental. 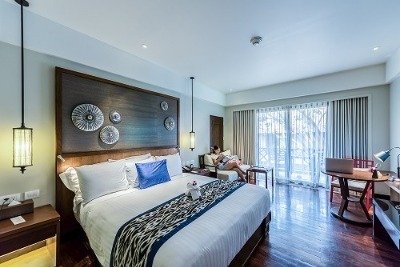 These rooms are comfortably furnished and decorated with full air-conditioning, flat-screen TV with cable channels, king-size bed, telephone and a private bathroom. The facilities at Bilton Hotel include: an event facility, 24-hour electricity, free parking space, swimming pool, a state-of-the-art nightclub equipped with assorted drinks and mini chops, and an exotic restaurant and bar/lounge. Guests can choose from a wide variety of local and continental dishes from the restaurant and order from a list of both alcoholic and non-alcoholic drinks from the bar/lounge. Security personnel monitor the premises round-the-clock. Bilton Hotel offers additional services which are made available on request. Some of such services are: 24-hour room service, laundry/dry cleaning, concierge services, banking services and car hire. The nearest airport is the Sam Mbakwe Airport, which is just 33 minutes away. Q: Does Bilton Continental Hotel offer free Wi-Fi? A: The hotel offers free Wi-Fi to all checked-in guests. Q: Does Bilton Continental Hotel have a swimming pool? A: There is an indoor swimming pool in this hotel. Q: Does Bilton Continental Hotel offer complimentary breakfast? A: No. Breakfast orders are made at a cost. Q: Is there a fitness centre/gym at Bilton Continental Hotel? What type of equipment are available? Q: Does Bilton Continental Hotel have a restaurant? A: A restaurant is available at Bilton Continental Hotel. Bilton Continental Hotels is an affordable hotel in Owerri, Imo. The hotel's management and staff were courteous and all my needs were well attended to. The rooms were comfortable. The toilet and bathroom had enough toiletries. The hotel had a nice serene environment and the services rendered at the hotel were impressive. For someone who is somewhat difficult to please I must say you guys are simply unbelievable! I liked every moment at your hotel. Your hotel had sufficient space for parking and enjoying the beautiful scenery. Your rooms are clean an tidy, the staff were considerate and very helpful too. I hope to make use of your hotel in the future. Please keep the good work! I spent five days in this hotel but could not sleep at night because of the bad bed, the mattress was very stiff like brick. I was not satisfied with the service. I requested for orthopaedic mattress and nobody attended to me. And the sound of the generator which was close to my room disturbed my sleep all the night. It was quite easy for me to locate this hotel but their service was poor. They first gave me the wrong key and then also gave me the wrong orders.They also had some amenities that were not working. I would only recommend this hotel if they improve on the quality of their services. Have nice pictures of Bilton Continental Hotels?